The ancient name of Amravati is “Udumbravati”, prakrut form of this is “Umbravati” and “Amravati” is known for many centuries with this name. The mispronunciation form of this is Amravati and now the Amravati is known with the same. It is said that Amravati is named for its ancient Ambadevi temple. The ancient proof of existence of Amravati can get from stone carved inscription on the base of marble statue of God Adinath (Jain God) Rhishabhnath. This shows that, these statues were set up here in 1097. Govind Maha Prabhu visited Amravati in 13 th century, at the same time Warhad was under the rule of Deogiri’s Hindu King (Yadav). In 14th century, there was famine (drought) in Amravati & people abandoned Amravati and left for Gujrat and Malva. The local people were returned back after several years at Amravati, the result of this was scanty population. In 16 th century, Mager Aurangpura (today’s, ‘Sabanpura’) was presented for Jumma Majseed by Badashah Aurangzeb. This reveals that Muslims and Hindus lived together here. In 1722, Chhatrapati Shahoo Maharaj presented Amravati and Badnera to Shri Ranoji Bhosle, by the time Amravati was known as Bhosle ki Amravati. The city was reconstructed and prospered by Ranoji Bhosle after the treaty of Devgaon and Anjangaon Surji and victory over Gavilgad (Fort of Chikhaldara). The British general author Wellesly camped in Amravati, particular place is still recognized as camp, by Amravati people. The Amravati city came in to existence at the end of 18th century. Union state of Nizam and Bosale ruled the Amravati. They appointed the revenue officer, but defense system was worsted. 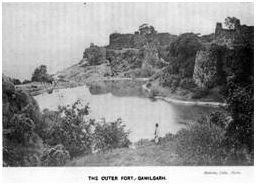 Gavilgad fort was conquered by Britishers on 15th Dec’ 1803. According to the Deogaon treaty, the Warhad was presented as the token of the friendship to Nizam. The Warhad had Nizams monopoly, thereafter. 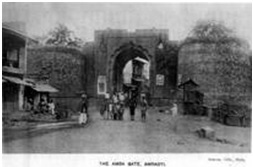 Near about 1805, Pendharies attacked Amravati city. The Sahukars and Marchants of Amravati saved Amravati by giving seven lakhs to the Chittu Pendhari at that time.The Nizam ruled for a half century. The people enjoyed British rule instead of cruel Mugals (Nizam). From 1859 to 1871, many government buildings were come into existence, which were built by the Britishers. Railwaystation was constructed in 1859; commissioner bungalow in 1860, Small cause court in 1886, (today’s S.D.O. OFFICE), the Tahsil office & the Main post office were built in 1871. During this time, the central jail, collector office, Rest house, cotton market were also built. During 1896, Shri Dadasaheb Khaparde, Shri Ranganath Pant Mudhodker, Sir Moropant Joshi, Shri Pralhad Pant Jog were the leaders in Amravati. The 13 th Congress Conference was held at Amravati on 27-29 Dec’ 1897 due to the efforts of these leaders. Shri Lokmanya Tilak and Shri Mahatma Gandhi visited Amravati in 1928. The Munsipal A.V. High School was inaugurated at the hands of Shri Subhash Chandra Bose. At the time of ‘Savinay Awagya Andolan ‘, Amravati held the head office of it. On 26 th of April 1930, the water was taken from ‘Dahihanda’ for the famous ‘Namak Satyagrah’, and Dr. Soman was brought the sea water from Mumbai for the occassion. Around ten thousand people were prepared the salt under the leadership of Shri Vir Vamanrao Joshi. Udumbaravati was the encient name of today’s Amravati. It was due to the presence of ample number of Audumber trees in the region. The name was further abbrevated as Umbravati, Umravati& Amravati. The city grown up rapidly at the end of 18 th century due to the growth in businesses. It was one of the richest town of the area. 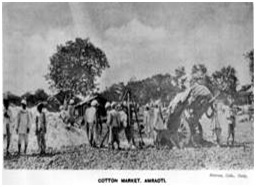 In 1853, the present day territory of Amravati district as a part of Berar Province was assigned to the British East India Company, following a treaty with the Nizam of Hyderabad. After the Company took over the administration of the province, it was divided into two districts. The present day territory of the district became part of North Berar district, with headquarters at Buldana. Later, the province was reconstituted and the territory of the present district became part of East Berar district, with headquarters at Amraoti. In 1864, Yavatmal District (initially known as Southeast Berar district and later Wun district) was separated. 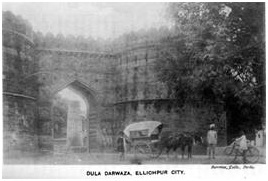 In 1867, Ellichpur District was separated but in August, 1905, when the whole province was reorganized into six districts, it was again merged into the district. In 1903, it became part of the newly constituted province of Central Provinces and Berar. In 1956, Amravati district became part of Bombay State and after its bifurcation in 1960, it became part of Maharashtra state. Geography Amravati city is situated 340 m above from the sea level. Pohara & Chirodi hills are in the east of the city. Maltekdi is one of the hills, which is inside the city. The hight of Maltekdi is around 60 m & the statue of great maratha kind, Shri Shivaji Maharaj is placed on the top of the hill. There are two lakes in the eastern part of the city, namely, Chhatri Talao & Wadali Talao. The city is located in the East Maharashtra on the altitude of 20o 56′ north & 77o 47’ east. It is the main centre of west Vidarbha. It is on the Mumbai-Calcutta high way.